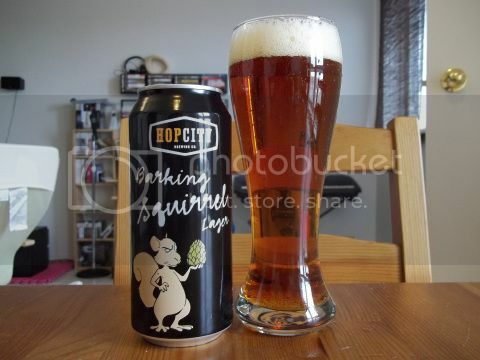 Barking Squirrel is the flagship beer of Hop City, a brewery located in Ontario, Canada. The beer pours a clear amber color with a head that sticks around for quite some time. Visually, it's really quite beautiful. If I were tasked with finding a picture of the prototypical beer, Barking Squirrel would be in the running. But we all know everything boils down to flavor. Well, my friends, Barking Squirrel Lager does not let us down. Initially, you're hit with excellent earthy malt flavors. There is a little sweetness there followed by a subtle toffee or caramel flavor on the finish. All of these flavors are balanced perfectly with the perfect amount of hops. There's also a unique mouthfeel to this beer. Middle of the mouth there is slightly dry feeling, but by the time you've swallowed the beer you're left with a very smooth and refreshing lager. True, my Canadian beer portfolio is rather small, but I'm going to declare this the best Canadian beer I've ever had. Looks like I've found a new Canadian beer to watch hockey with.....well, if the NHL ever gets their act together. That's surprising. Regardless, hell of a beer. It is NOT made by Molson! You're and idiot for posting that remark. I love this beer.Excellent taste.